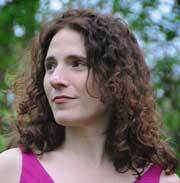 An interview with Anne Ursu, author of Breadcrumbs. Breadcrumbs makes reference to lots of well-known fantasy works that generations have loved: A Wrinkle in Time, The Golden Compass, Harry Potter – and also classic fairy tales, such as The Snow Queen. (I might add that all include fabulous strong girl characters, too.) Breadcrumbs is a beautiful blend of both of those traditions. 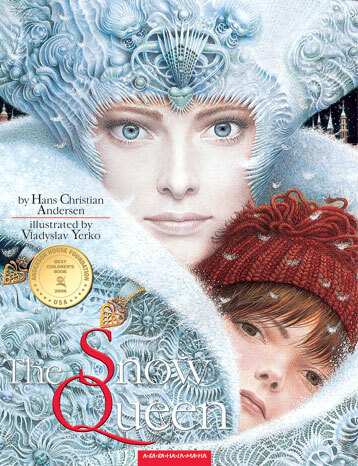 Were you a fan of fantasy or fairy tales as a child? What drew you to those stories then, and what still calls to you? 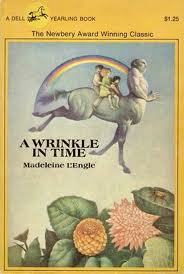 A Wrinkle in Time was one of my favorite books as a kid. I was actually Charles Wallace in a touring theatrical version that had about 70 performances, and so that story is in my narrative DNA. I generally tended to read more realistic books, or books about very real kids dealing with strange powers (see: Duncan, Lois). But I loved fairy tales, and can remember lying in my bed reading them at night. As I type this, my little boy has just announced he’s going to go into his room and read all the fairy tales in Lucy Cousins’ Yummy—this is the fantasy writer’s equivalent of when your kid hits a grand slam in t-ball. Mal’s mirror reflects and amplifies every imperfection – and it’s what starts all the trouble for Hazel and Jack. It’s a wonderful metaphor for our shaky self- concept as we move into adolescence. Sadly, I think I stared into that awful mirror for years when I was a kid. Did you get any glass in your eye, too? I don’t know if it’s possible to go through adolescence without getting some shards stuck somewhere. I remember friendships shifting, warping, breaking— and I remember my vision of myself doing the same thing. In fact, I think it wasn’t until high school when I got a sure, supportive, wonderful group of friends that both affirmed and complemented who I was that that conception became more fixed. I suppose when we’re growing up our peers have a lot of control over that mirror—whether it’s one that warps or sharpens. It’s hard to call your novel fantasy because you’ve managed to root it so firmly in the every day world of elementary school. And yet, the magical elements are completely believable, too. How did you manage to merge those two worlds together without showing your seams? I’m very glad to hear you feel that way. It just seemed to be what the story needed to be able to work, what the book called for, as well as what Hazel really needed. I think it helped to keep thinking about the setting merely as background to Hazel and her journey—the world might shift, and the metaphysics as well, but there’s always Hazel going forward on her journey (both internal and external). And I wanted the worlds to have thematic resonance with each other, that there would be echoes from the real world into the fantasy world (and vice versa.) So even if the landscape changed, the same ideas still held those worlds together. Maybe it’s like the mirror again—on one hand there’s the world as it is, inside the mirror is the funny warped fantasy reflection, and standing right in the middle of it, looking back and forth to each world trying to figure out what they say about each other is Hazel. Hazel is imaginative and original – and the punishment she receives for those qualities is being an outcast at Lovelace Elementary. I have to tell you, my heart broke for Hazel every time she had to go to school. What are your thoughts about creative girls like Hazel as they start to move away from childhood? And, related to that, what role do schools have in encouraging – or squelching– creative spirits like hers? You capture the social world of kids so well. What is magical about cross gender best friends? What are the land mines? And, in thinking about how the book resolves for Adelaide and Hazel, why do healthy girl friendships matter? When I’ve gone to bookstores and schools, I’ve had some kids tell me that their best friend is the other gender and so they related strongly to Hazel and that just makes me so happy. It happens so much, and yet our culture I think is driving an increasingly bigger wedge between boys and girls. Everything is so gendered—you could write a whole dissertation on gender as constructed by t-shirts marketed to boys vs. girls; there are even Legos just for girls now, which kills me. I have a big brother, and he was so important to me growing up. He’s so much a part of my personality, and a big reason I’ve always gotten along well with boys. When I was young, one of my best friends was a boy, but we grew apart around fourth grade. And I didn’t have good male friends again until high school. But looking back, these times in my childhood and adolescence when I had both good male and female friends were the times I felt most comfortable. Part of being this age is figuring out who you are in the world, and what the world is to you, and I think having friends of both genders helps you navigate all those tricky internal waters. For Hazel, I think she needed to realize there was a whole world out there that can complement the one she lived in with Jack, and that both could co-exist and bring out different parts of her. And that each friendship would only add to the person she is, and who she could become. What is it about Hazel that makes her an especially strong girl? Hazel is surrounded by a lot of people who have given up or given into the forces around them—in both the real world and the fantasy world, where all these people have lost themselves to fairy tales. Time and again, she sees the allure and ease of losing yourself to fantasies, or simply shutting yourself off all together. She comes to understand that in many ways these choices are easier, but she never makes them. She always picks the harder, truer path, even though with every step she has to give up more of herself to do so. She keeps having to adjust and change, she even realizes she might lose her friend by rescuing him, but she still never stops trying. She forsakes the comforting lie of the happy ending for the knowledge that nothing in the future is sure, and she walks into that future anyway. I think it’s both allowing herself to see what no one else around her can, and then pushing forward anyway that makes her strong. Also, she reads a lot of fantasy. The memory of giving Hazel his prized baseball is what breaks the spell on Jack once and for all. Why did you choose that object as the key to bring them out of the wintry forest? How does it connect to how children can survive the real ugliness that sometimes filters into their lives? I think when you’re writing, something in your mind understands the story before you do. So in the first draft when Hazel was packing her backpack I just threw in this baseball that I thought would be a tangible symbol of their friendship that Hazel could keep to give her strength. But, well, it was a tangible symbol of their friendship—the very real symbol of their bond, of Jack’s love for her, and it slowly became clear how important it was. The baseball was enchanted, but not by fairy tale magic—it was just enchanted with their love for each other. It’s this every day beauty—the magic we create through our connections to other people—that can give us strength. In this case, in an uncertain world, the baseball becomes literally something to hang on to. Writing for middle grade is a tricky business sometimes. The reader is old enough to be aware of frightening adult issues swirling around, but is also still inexperienced in lots of ways. What are the decisions you make as a writer when you bring topics such as divorce and mental illness to children who are 9 – 12 years old? I think the best thing you can do for kids—or for any reader—is give them stories that are whole and resonant and true. In this case, those issues were part of what the characters needed to be whole and to make their journeys in the book work. But more, kids face issues like this all the time. When you’re little, everyone tells you things are going to be all right all the time. And then you grow older and you see that they aren’t. This age is about learning about the world, and learning that sometimes things aren’t all right. And I think stories keep kids company through that experience. I think our first and most important job as writers for this age group is to give these readers our absolute respect, and part of that respect is to tell them the truth. Breadcrumbs was part of NPR’s Backseat Book Club, wasn’t it? How did that exciting project come to be? What was that experience like for you? It was thrilling. Michele Norris is so gracious and astute, and meeting her was incredible. And I love anything that celebrates literature for this age group. But mostly it got people reading and talking about the book—and that’s pretty much the best thing that could ever happen for a writer. Listen to NPR clip here. Are there new projects you’d like to tell us about? Finish this sentence for me. Strong girls ….